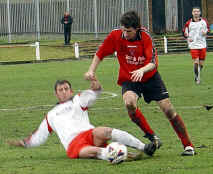 Port headed West today for a 3rd round OVD Scottish Cup replay with Kirkintilloch Rob Roy. Ground conditions were heavy and the loss of Ralph Hunter who is on the injury list was lightened with the return of Ports influential player Scott Peters. Port started strongly with close efforts from Brian Criaik. 18 minutes and with Port maintaining a strong pressure on the Rabs goal area the breakthrough came from a Barry Mcnaughton drive taking a deflection sending it high over keeper Smith head and into the net. One minute later on Ports next attack a stunning volley from Roberto Morris found the back of the net all from 35-40yards out with Roberto celebrating in style sliding bodily on the rain sodden pitch, has to be a top contender for goal of the season. Not to be outdone 3 minutes later comeback player Scott Peters let rip from 22 yards with a right foot drive taken at waist height and splitting the Rabs defence with keeper Smith firmly stuck in the mud. 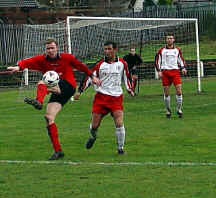 Next up was Gareth Dailly finding himself alone behind the Rabs back four after a neat through ball from midfield. Gareth quickly turned and sidestepped the advancing keeper to slot home from 18 yards. The opening period closed with Port continuing to press the Rabs goal area. The Rabs did find themselves down to 10 men after the removal of Mc Donald. Second period was a much slower affair as Port had to play into the strong westerly gale. For 20 minutes midway through the half the driving rain did not dampen the players spirits from both sides with Brian Craik going close on 53 minutes for Tayport. Not much to report in action until the closing minutes when The Rabs broke down the right on 89 minutes and sending the ball across the Ports goal area for a simple tap in catching the Port defence on the hop. Port quickly replied from the kick off with a Sean Christie cross ball from the left finding Kevin Heenan who slid the ball past the advancing keeper high into the top right corner for a 5-1 victory. Despite horrendous weather Cainnipairt was still able to hold this Super league encounter. North End set out from the start defending well in depth. 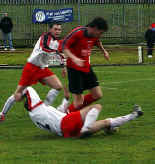 This tactic stood them well for most of the match with Port having few goal scoring opportunities. 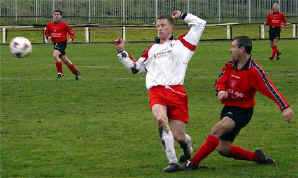 One goal seperated the sides after 58 Minutes when a Steven Stewart shot struck the upright and cannoned along the line. 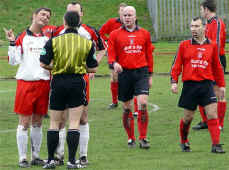 The referee assistant judged the ball had gone over much to the dismay of the North End players. Not much more in chances followed with the three points taking Port to within 2 points of Super League leaders Bathgate Thistle.